We envision the CRCNA participating in missions throughout Guadalajara and Jalisco State with Presbyterian churches and other evangelical entities to see the gospel of Jesus Christ proclaimed, healthy churches emerged, and the Kingdom of God advanced. Our mission is to represent and lead CRCNA ministries in Guadalajara and Jalisco State, and to work alongside our national partners to witness to the Good News of God’s Kingdom, promote integral discipleship, and promote ministries that strengthen families, leaders, churches, and communities. Guadalajara is Mexico’s second largest city with a population of over five million people. It is known as the cradle of Mexican culture since Mariachi music, tequila, and the Mexican hat dance all originated here. Ninety-five percent of Tapatíos (what people from Guadalajara call themselves) claim to be Roman Catholic, although only a minority of them practice their faith in any meaningful way. That strong minority, however, is firmly entrenched in its cult to a whole array of saints and virgins sadly perpetuated by the Roman Catholic Church itself. Today, between two and three percent of residents in Guadalajara belong to an evangelical church, although many others claim to be Christians without an official church affiliation. We work mostly with the National Presbyterian Church of Mexico (NPCM), a historic Reformed denomination which traces its roots in Mexico to the 1870s. Up until the mid-1990s, the NPCM had only one church in Guadalajara. Today, there are around fifteen churches; however, many of them are still tiny “missions” or daughter churches. 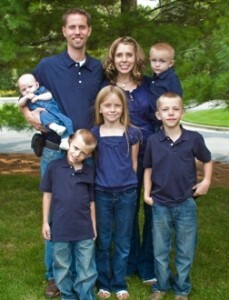 We were appointed as missionaries to Guadalajara in 2003 and arrived here in early 2004. Since 2005, we have been involved in the planting of the “Christ the Savior” Presbyterian Church in the Moctezuma neighborhood of Guadalajara. Most of our ministry day-to-day is focused on evangelism, discipleship, and helping the church to get established in the neighborhood. Although there is much work left to be done in Moctezuma, we look forward to starting our second church plant in 2010. We are also helping to start a cross-cultural training program for Mexican missionaries that will train people to cross cultural barriers within Mexico to reach towns and villages without an evangelical presence. Our long-term desire is to continue participating in church planting and leadership training with a view towards establishing a presbytery of churches in Guadalajara committed to proclaiming the gospel of Jesus Christ, growing new and healthy churches, and advancing the Kingdom of God in Jalisco State.